Federal's American Eagle line of ammo is a great value to bulk shooters. These bullets are perfect for defensive training, IDPA and 3-gun competitions, and are cheap enough for plinking with friends. American Eagle ammunition is manufactured at the same plant as Federal's premium ammo, with the same processes and quality control. This 9mm ammo is loaded with a 115 grain full metal jacket bullet, and uses an economical boxer primed brass case. This ammunition will have a very similar kick and trajectory to Federal's 115 grain defensive loads. Federal Premium Ammunition is located and headquartered in Anoka, Minnesota, where they employ approximately 1,400 people. The Anoka facility produces large quantities of ammunition, which is shipped all over the country, and used for training, self defense, law enforcement, and hunting. Clean, reliable and accurate. What more do you need? My first time to buy from BulkAmmo. Great ammo, shot almost 500 rounds, no misfires. Greater service....ordered on Wednesday received on Friday. BulkAmmo requested I provide feedback on my order experience and the ammo itself. I normally do not review products or suppliers. Who cares about my opinions? This was my second order from BulkAmmo, both orders were shipped and arrive within two working days. They were well packed, clean and store shelf new. My second order contained 5 different products and was correctly filled. Website navigation and ordering is simple and quick. Although I shoot every week, to date I have only fired 100 of the American Eagle 115gr FMJ rounds. Zero problems. The ammo does not burn quite as clean as Winchester or Remington. Overall performance is excellent as a practice round. Three-star rating on bargain is fair, prices are competitive but, not always the lowest. Service is topnotch, I will order from them again. Best rounds for the buck. My police dept only uses Federal ammo and I can say that this ammo has never failed me while performing training or tactics drills. Always been a fan of AE and will continue to buy them. Got the ammo at a great price, ....can't beat that. Good looking, good quality, works well in my S&W Auto, cheaper in bulk. I am pleased. Thank you. Good web site, easy to order. Perfect! Just what I ordered. Good looking and shoots reliable in ourk delivery. I'll be back. The 9mm ammunition from Federal is a reliable performing ammunition. I enjoy using it at pistol and IDPA ranges. Great deal for range work! It Had to Be On the Way Before I Ordered It ! 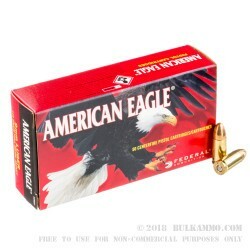 American Eagle by Federal makes some awesome ammunition. With over 5,000 rounds down-range, in calibers of .380 ACP, 9mm Luger and .45 ACP, American Eagle cartridges have never failed me.....not one single time. No jams, no mis-fires and no squibs. 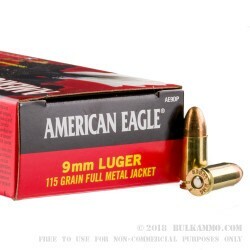 I highly recommend American Eagle rounds by Federal in FMJ for your routine rangetime. For your personal defense round, may I strongly recommend the Hydra-Shock by Federal Cartridge. These are designed as a hollow-point with a center post to help control the bullet expansion, allowing for shallower penetration with larger and more damaging results for soft-tissue targets. Over the past year I have used over 5,000 rounds of .45, 9mm, .357 and .44 magnum ammo. Never had a single jam in Desert Eagle, Ed Brown, Nighthawk, Colt, Ruger and a few others- NO jams. I can't compare the quality to Hornady, but it's very good ammo. Ordered 1,000 rounds via the internet and it was delivered to my front door in just under 40 hours. I took advantage of the Labor Day Sale so the price was reasonable. Fired off the first 200 rounds and NO problems. I have referred this site to my shootin' buddies and they are all waiting for their favorites to go on sale. American Eagle is the only ammo I shoot in my Arcus 98 DAC.9mm. In about 800 rounds I have had no malfunctions of any kind. I dissasemble my Arcus after every 300 or so rounds for cleaning and IMO it is a very clean burning product. 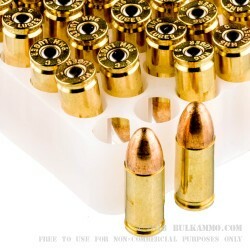 This was my first experience buying ammo online, but now I'll only buy ammo from this site. I looked at a lot of sites for bulk ammo and this site had the cheapest prices and lowest cost shipping. I received the case in 2 days. I picked it up when it was on sale a little cheaper than the current price but even the current price is really good. I've put 50 through my Gen4 Glock 19. An acquaintance put 10 through his Gen3. And another put 50 through her XD. Not one failure. BulkAmmo shipped and I had it in 2 days. Customer service responds on Saturday and Sunday. That is amazing! Quality product and quick shipping. Excellent rounds for targeting shooting. A: Hello James, This specific product from Federal is packaged in 50 round boxes with 20 boxes per case. Q: Our indoor range does not allow steel. We were unable to use the Tula. Will we have the same issue with this? A: Hello William, This Federal American Eagle does not contain any steel in the projectile. Q: Are these rounds manufactured in the USA? A: Hello Dan, This ammunition is manufactured in the US by Federal. Q: Is this a good bullet to use on a brand new glock 17? A: Hello John, The Federal American Eagle is a great quality option to be used in a G17. Q: What velocities are these rated at? A: Hello Mark, This ammunition is loaded to standard 9mm Luger velocities. Federal lists the muzzle velocity as 1160 fps. A: This ammo is loaded to SAAMI specifications and should function in any serviceable 9mm Luger firearm. Q: It's my understanding that there is a move by our government to ban lead in all ammunition. What I have read is that quite a few sportsman's groups are agreeing to this. What is your understanding about this ban? A: This ban was discussed a few years back but seems to have been defeated, or at least derailed, but will certainly come up again in the future. 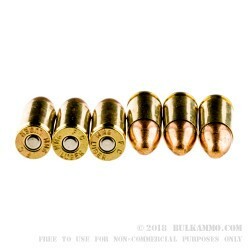 Q: What is the max amount of times that this brass can be reloaded? A: This is highly dependent on your loading procedures and pressures, but it would not be unreasonable to expect 5 to 10 reloading cycles out of this American Eagle brass.